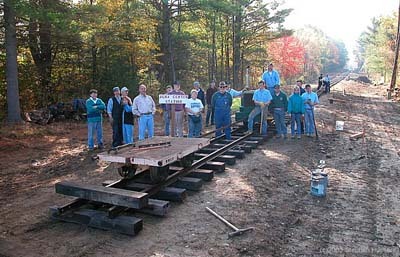 For the past three years, members and friends of the Wiscasset Waterville & Farmington Railway Museum have gathered at Sheepscot Station near Wiscasset, Maine, over the Columbus Day weekend to build track on the grade of the famed two-foot gauge railway. The original WW&F abruptly shut down in June 1933 following a derailment, and was scrapped in 1937. 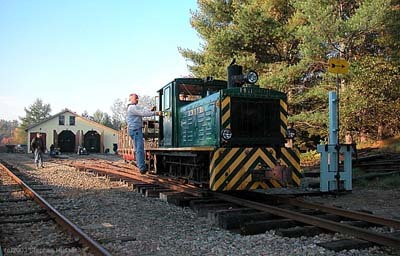 In 1989, a small group of enthusiasts organized as the Sheepscot Valley Railroaders. In 1991 they laid 61 feet of rail on the former WW&F grade north of Cross Road. By that time, the group had renamed itself the WW&F Railway Museum, attained federal 501(c)3 status, and begun laying rail north toward Albion, the terminus of the old WW&F. Since then, they haven't looked back. By 1993 the museum&apos;s line was 110 feet long, and it continued to grow substantially in subsequent years. Membership in the WW&F Railway museum has grown steadily as well, from less than 25 originally to over 800 today. A surprising number of those folks turn out throughout the year to help with various projects. 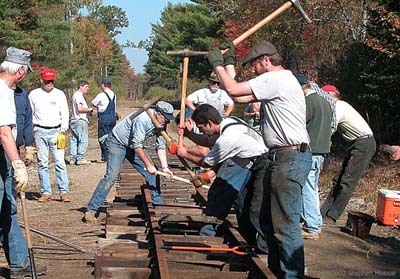 For the two big trackwork weekends, spring and fall, it's not unusual for members from Pennsylvania, Maryland, Georgia, Ohio, Illinois and other distant states to join local and regional members from Maine and New England to spend two, three or even four days working. One member even came from Oregon for two work sessions. 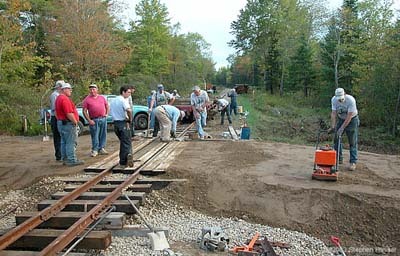 Over the Columbus Day weekend this year, a cadre of volunteers laid over 1,200 feet of track during a four-day period, extending the museum's line to over 1.5 miles total length. During the weeks preceding the meet, museum regulars cut and stockpiled over a thousand ties near the current end of track and moved several hundred feet of rail to temporary storage in the same area. Over the weekend of Sept. 28, a crew of museum regulars constructed a grade crossing over a private lane, the crucial first step in extending the track to Alna Centre. 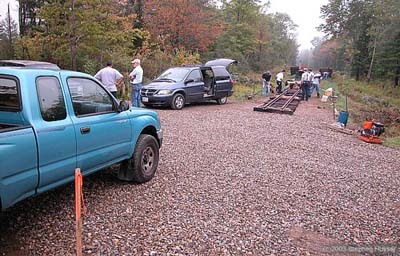 The crossing project had to be accomplished in a single day since the gravel road gives access to several homes. September 27th, 2003. Trask crossing before and after. The above photo shows the previous end of track and was taken at approximately 8 a.m. Saturday morning; the lower picture, later the same day at 6 p.m. This writer has participated in several "Track Meets" at the WW&F after joining the group in 2000. Since I live in Pennsylvania, I can only manage semiannual trips to Maine. I headed north on Thursday, October 9, arriving at my motel in Wiscasset around 5 p.m. I couldn&apos;t stay away from the museum until the next morning, so drove out to the site and found several other members making last minute preparations. Bright and early Friday morning at 7 a.m., I joined about 15 others at the museum. After loading all sorts of track tools and materials, we climbed aboard #118, a genuine WW&F flatcar, and were shoved out to the end of track by diesel loco #52. We were preceded by Brookville gas loco #51 pushing a small, steel, heavy-duty pushcar. After unloading the tools, we turned to loading ties onto the pushcar. Steve Zuppa and Fred Morse use WW&F Ry #52 (Plymouth 1961) to assemble the day's work train. The enginehouse and machine shop can be seen in the background. One of the little quirks of the WW&F Museum is the desire to do as much as possible on the reconstructed railway in the same manner it was done a century ago; therefore, nearly all tasks are done with manpower. The gasoline and diesel locomotives are just about the only concessions to modernity in the track-building department. The Brookville loco shoved the pushcar, now loaded with ties, to the very end of rail, and willing hands picked up the ties and carried them north along the right-of-way, placing them 24 inches apart. I should explain that the WW&F&apos;s right-of-way had been cleared by a hardy gang of volunteers who spent winter Saturdays cutting down trees, trimming off branches and rolling the large logs off the grade. The trimmings were burned, and some of the logs were actually hauled away to a sawmill and sawn into lumber for construction projects on the line. 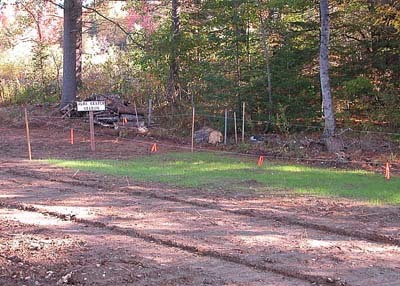 A friendly contractor had used heavy equipment to uproot stumps and smooth the grade, creating a relatively flat area on which to build track. Even before the second pushcar load of ties had been unloaded, folks had begun marking the ties for receipt of the line rail field side spikes, the spikes were laid out on every tie, joint bars were placed between every 15th tie, along with bolts, nuts and lock-washers. A couple of workers grabbed spike mauls and proceeded to set the field spikes. In the meantime, the pushcar was hauled back to the rail pile and ten rails were loaded. When the rail was moved up to the end of steel, everyone concentrated on the rail. Many hands make light work as volunteers hand-carry a length of 56 lb. rail and lower it into position. The WW&F track guys have devised an excellent method for extending the track in 150-foot cycles. Sixteen to 18 people lined up next to the rail on the right side of the pushcar. On the command "To the edge of the car," all hands slid the rail to the edge of the car. The next command was "Lift," and with 32 to 36 sets of hands and muscles lifting, moving a 560-pound rail was relatively easy. "North," barked the crew leader, and everyone carried the rail along the push car. As they reached the end of the rail on the ties, the leader, who was the last man on the rail, counted down the distance. Then, "east" toward the gauge of the track, "down" onto the ties, and finally"south" to bump the rail against the previous rail. As soon as the second rail was down, the crew leader shouted "Instatrack." This is a tongue-in-cheek name for notched 4 x 4 timbers clamped to the base of the two rails to hold them to gauge. Primitive but effective! 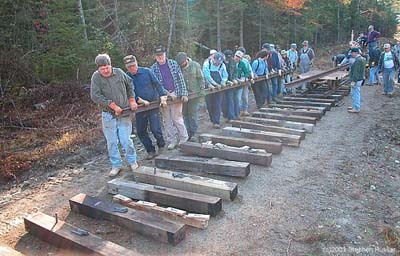 As soon as four Instatracks were in place, the rail cart was moved forward and the routine was repeated. The entire process, from the lifting of the rails from the cart to moving the pushcar ahead, took less than 10 minutes per rail. Saturday morning. With "insta-track" in place, Gordon, Rick, Wayne and Jason bolt the jointbars and rails together. 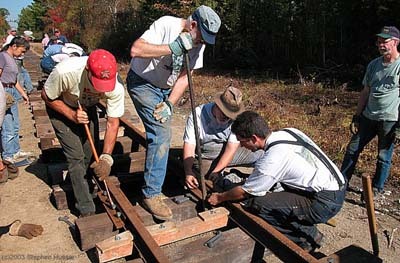 When five rails per side, or 150 feet of track, had been laid on the ties, the cart was rolled back out of the way, and several groups of volunteers grabbed spike mauls and began driving spikes to hold the line rail in place. Just as soon as the line rail was spiked down, track gauges appeared and the field rail was spiked into place. We had the first 150 feet of track in place by 9 a.m. The pushcar, now emptied of rail, was taken back to be loaded with ties. James Patten (foreground) displays his knack for effortlessly driving spikes. Swinging the mauls with equal skill behind James are Jason Lamontagne and Rick Sisson. The wail of diesel 52&apos;s air horn heralded the arrival of more volunteers, who were immediately pressed into service loading more ties on the push car, which was then hustled forward. The ties in this particular case were actually wooden highway guide rail posts, which the museum was able to purchase very cheaply. They had been treated with creosote and were trimmed to about 5 feet in length. Their 6 x 8 inch dimensions were very close to typical railroad ties. Some volunteers were able to grab one and fling it over their shoulder to carry forward, but most folks preferred to team up and carry one between two people. A long tape-measure was on the ground, so it was easy to place the ties every two feet, and it didn&apos;t take long to get 80 of them down. As the track pushed north from the former end of track, the wait for ties or rail became longer, and there was plenty of time to chat with other volunteers. Some of us took the opportunity to walk north to the end of the graded right of way, admiring the fresh grass planted at the site of the station at Alna Centre. A sign announced to all that the station had been located here. Sign located on the former site of the Alna Center station, and grass freshly planted by museum member Fred Morse. By lunchtime, the gang had laid 300 feet of track. We all piled aboard the flatcar and were soon back at Sheepscot station, where we found a dozen pizzas, a big pot of beef stew, coffee and soft drinks waiting for us. After the lunch break, we climbed aboard the flat and headed north again. The afternoon pattern was similar to the morning&apos;s activities. We were a bit overfed, though, which moderated our pace. By the end of the day, we&apos;d built an additional 210 feet of track -- not bad for 39 or 40 volunteers, many of whom are middle-aged or older. The last activity of the day was a huge dinner spread prepared for us by several members; we draped ourselves over station benches, picnic tables and inside coach 3 to enjoy it. Saturday morning, we were hard at it again. Each train that arrived from Sheepscot discharged a few more volunteers, and a check of the log book at the end of the day revealed that 53 people had worked track. There were probably more than that, but some folks didn&apos;t sign in. By Saturday night, we had built another 720 feet, bringing us to Alna Centre. Someone observed that when engine 51 arrived with the last load of ties, it was the first time a train had been at that site in 70 years. Sunday morning's early-bird crew briefly poses for photos before taking a break for coffee and chocolate milk. We were still about 70 feet from the end of the graded right-of-way, so on Sunday morning we laid an additional 60 feet of track. When we were done there, we all moved back south of the crossing and began to surface the track in that area, which we had ballasted during the spring trackwork session last April. In one its few concessions to 20th century railroading, the WW&F had decided to allow the use of power tamping equipment. 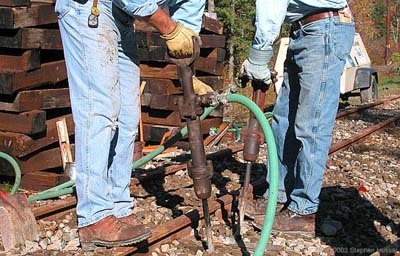 Since no one knew of a two-foot gauge tamper, hand-held pneumatic units known as "jitterbugs" were used. However, all lining and jacking was still done the old-fashioned way. Air-powered Jitterbug tampers in use on the curve to Trask crossing. Ballast was hauled to the site on the flatcar, just as in days of old, and everyone set upon the car with shovels, shoveling the stone off and throwing it between the ties or piling it at the ends of the ties. As the track was filled up, the flatcar was moved ahead. It was hard work, but with a large crowd, we were able to empty the flatcar in 15 minutes. Depending on how much the track had to be raised, sometimes we had to fill the track two or three times. By late Sunday afternoon, it had started to rain, and many of us were pretty tuckered out, so this work didn&apos;t proceed as rapidly as we had hoped. We did get all the lining and raising done, but only got about 150 feet of track tamped. Since I had to return to Pennsylvania to go to work on Tuesday, I didn&apos;t return to the museum Monday. However, photographer Steve Hussar reports that a small crew of about 15 nearly finished the tamping. When we looked at the 1,260 feet of track we laid from Trask crossing to Alna Centre, we knew what we&apos;d be doing during the spring 2004 Track Meet at the WW&F: lining, jacking and tamping! When that track is placed in service, the WW&F will actually have a destination for its trains.